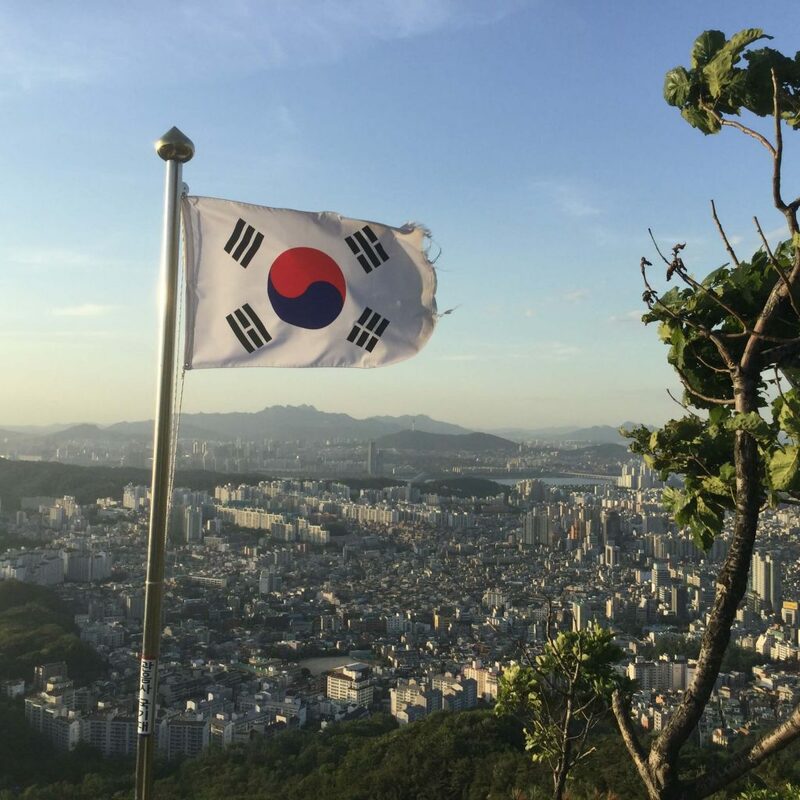 Gwanaksan (관악산, or 冠岳山 in Chinese characters) is located on the southern edge of Seoul, forming part of the boundary between Seoul city and the neighbouring province of Gyeonggi-do. Standing at 632m it isn’t as high as Bukhansan and Dobongsan on the city’s northern edge, but it’s more easily reached from most of Seoul so offers a good combination of being very convenient but still getting up to a fair height above the city; it’s also home to some beautiful temples, and the city views are awesome on a clear day. 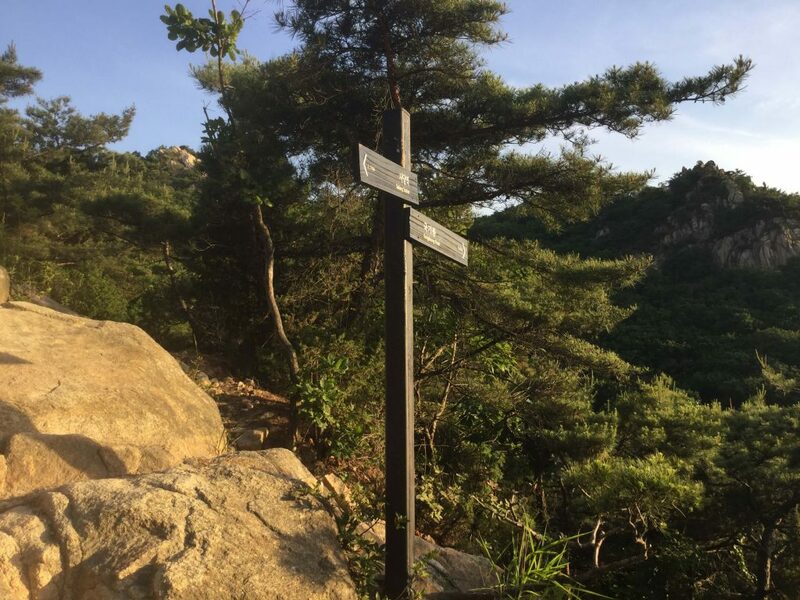 Gwanaksan is therefore very popular with the legions of Seoul hikers and the trails and viewpoints can get pretty crowded on weekends in fair weather; try to hike it on a weekday if you can. 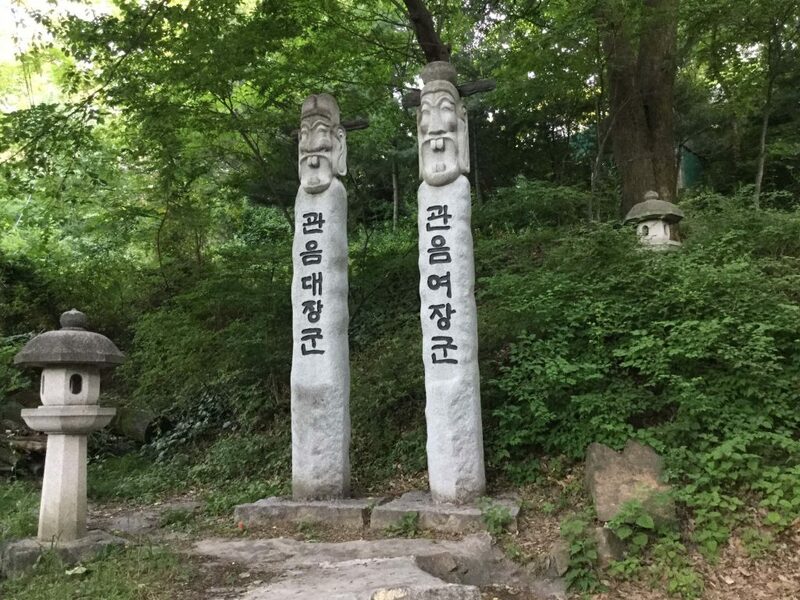 There are three main routes up Gwanaksan; the most-trodden trail goes up from Seoul National University on the west side of the mountain, with another good trail up the east side from Gwacheon Station on Line 4. 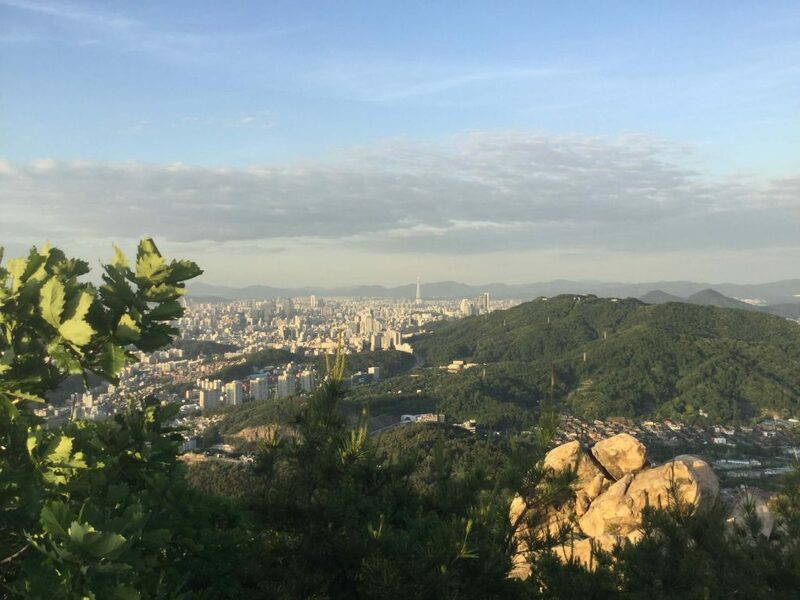 These two trails are well-maintained, easygoing hiking paths through the forest; the most interesting trail is the one up the north ridge from Sadang, which is far more exposed and therefore offers cracking views out across Seoul from multiple viewpoints on the way up. The Sadang trail also covers much rougher terrain with some rock scrambling in places, which is fairly serious on the final section with fixed ropes and chains for you to pull yourself up. 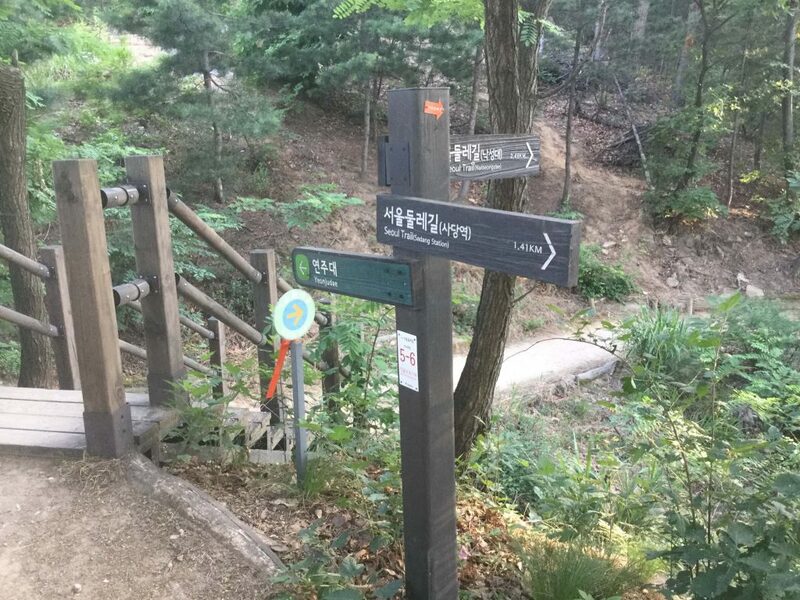 My recommended route for hiking Gwanaksan is to go up the Sadang trail, then descend to Gwacheon rather than SNU as Gwacheon has direct subway access (meaning you don’t have to mess around with buses). 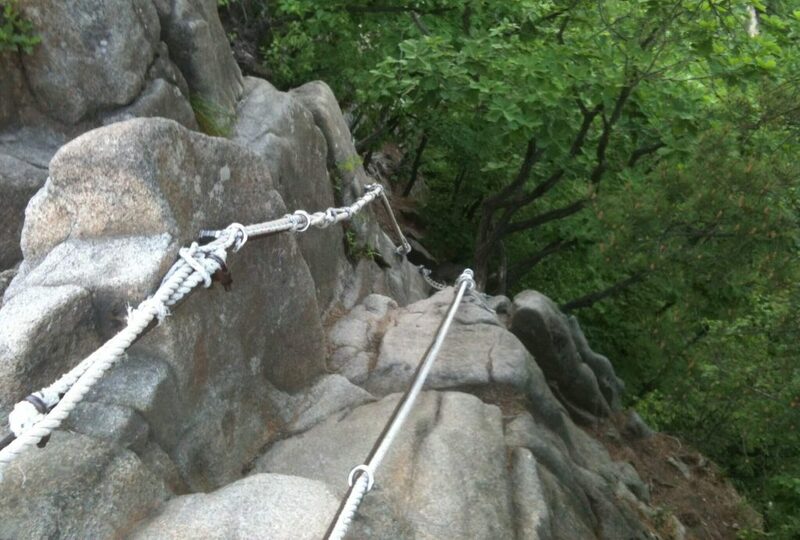 However, for those who don’t like heights or don’t feel confident about tackling the semi-rock climbing sections on the Sadang route, I recommend going up from SNU and down to Gwacheon (or vice versa). Roughly speaking, each of the routes takes around 90 minutes to 2 hours one way, though the Sadang route is slightly longer and tougher than the others so may take a little more time. It’s also quite easy to end up spending a fair time at the summit enjoying the views and checking out the temple buildings, so as a rough guide you can probably expect a 4 to 5 hour hike. 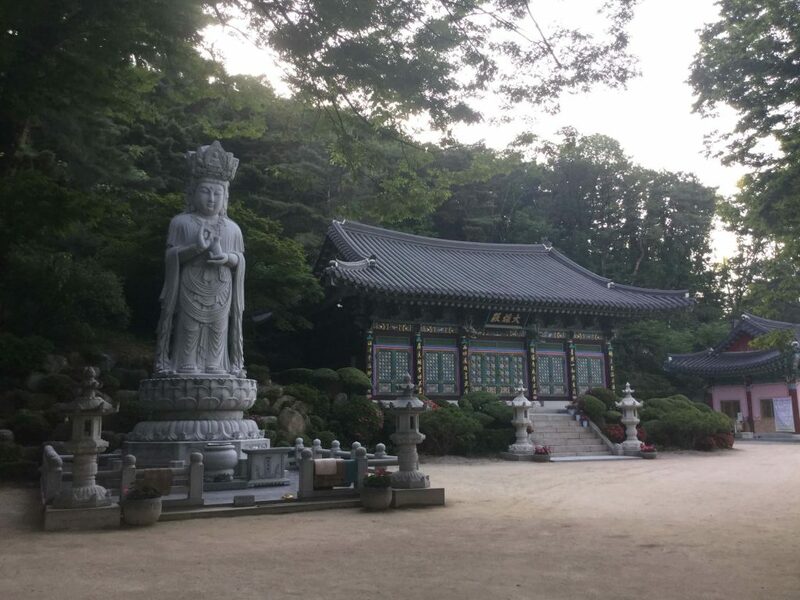 There’s quite a lot going on at the top of Gwanaksan, with a radio broadcast facility (which is the upper end of a staff-only cable car from Gwacheon), a radar station, and the large Yeonjuam Hermitage (연주암) complex including the famous clifftop Yeonjudae temple. The mountain actually has twin summits, with the radio antennae on the south summit and the radar station on the north summit; the south summit is completely covered by the radio facility and inaccessible to hikers, so the goal for your hike is the north summit. There you’ll find a big slab of granite just below the radar ‘golf ball’ to chill out on and take photos from, and Yeonjudae which is accessed via a small path round the cliff top. 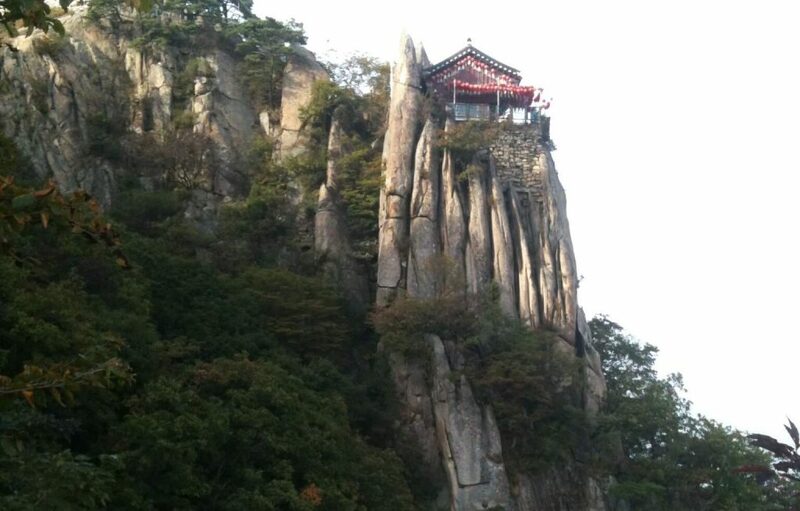 The rest of the Yeonjuam Hermitage buildings are spread out just below the ridge connecting the two summits, on the east side of the ridge. Be prepared for some rock scrambling on the final summit section; some of it involves pulling yourself up using fixed ropes. 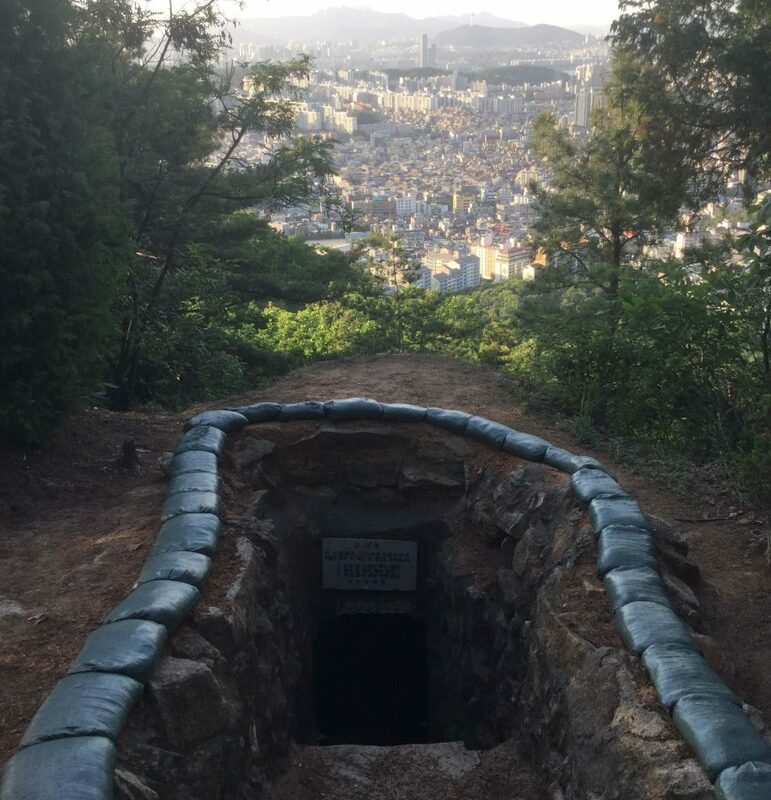 It’s good fun, but won’t be for everyone – if that’s you, hike up from SNU or Gwacheon instead! 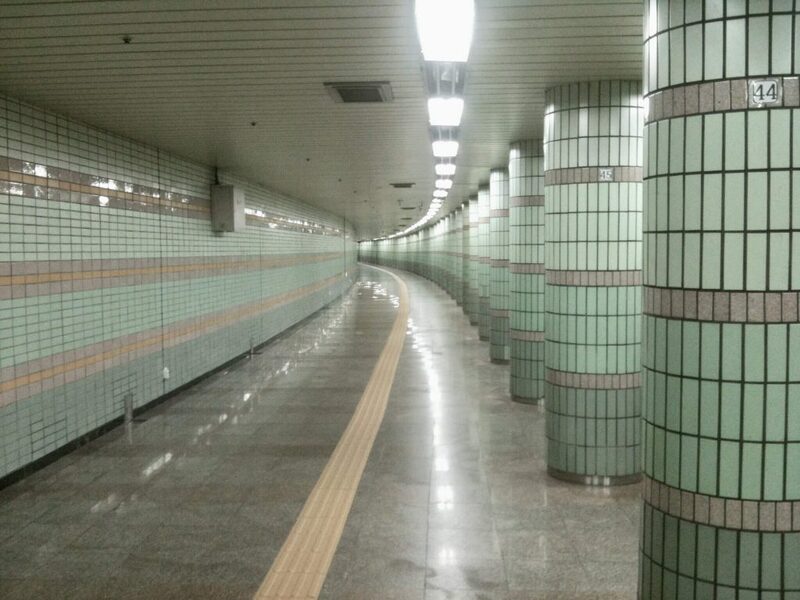 To get to the start of the trail, ride the Seoul Metro to SNU Station on Line 2 and take exit 3, and then jump on a bus at the stop there. At time of writing you can take bus numbers 5511, 5513, 5515A, 5515B, 5520, or 5528; this could of course change, so the main thing to check is that the destination of the bus is Seoul National University Entrance (서울대입구, Seoul-dae-ibku). 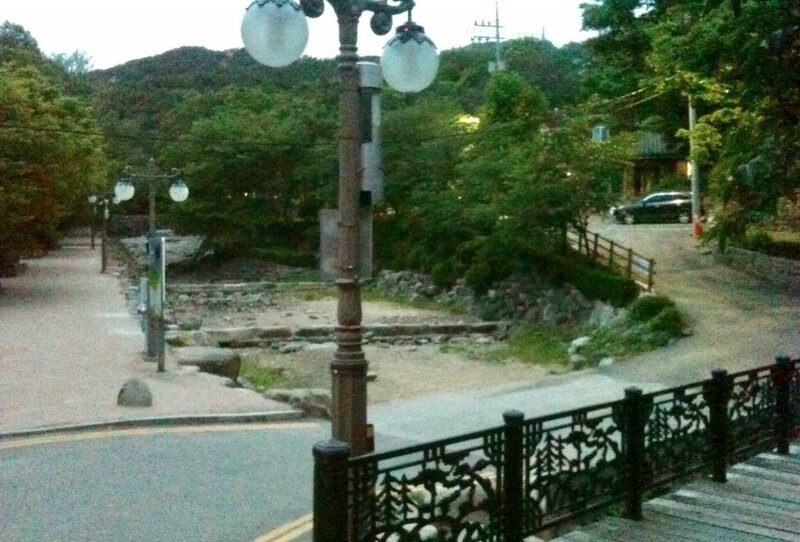 You can also walk, which takes about 20 minutes; if walking take exit 2 then just follow the main road (Gwanak-ro) south up and over the hill to SNU. There’s a map there to the side, and you can easily find your way up the trail; the lower part is fully paved, then it becomes more of a mountain trail further up but with the wooden walkways and flights of steps in places it’s fairly easy going. You’re hiking up through the forest, so you don’t catch much in the way of views until you get to the top. 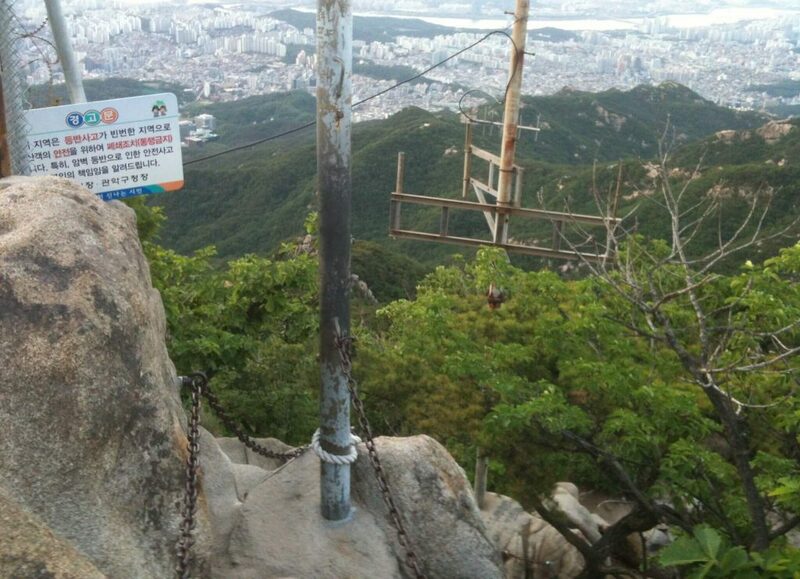 After two hours or so you reach an intersection on the summit ridge (often manned by a vendor selling makgeolli, a fermented rice drink favoured by older Korean hikers – some like to sit and get quite pissed up! 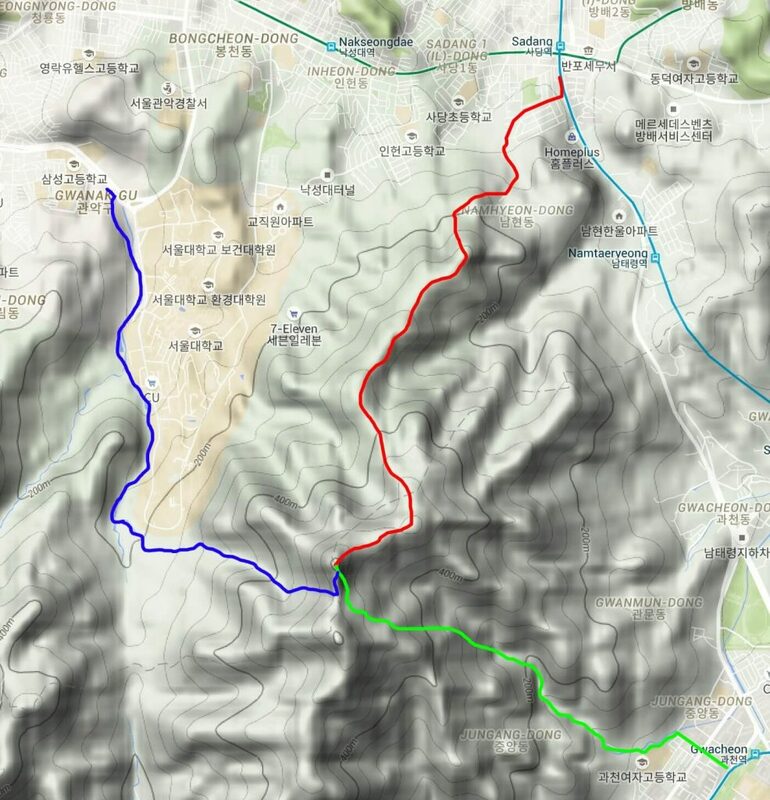 ); turning right leads over to the radio facility, turning left leads directly along the ridge to the radar golf ball, and going straight ahead leads down to Yeonjuam Hermitage. 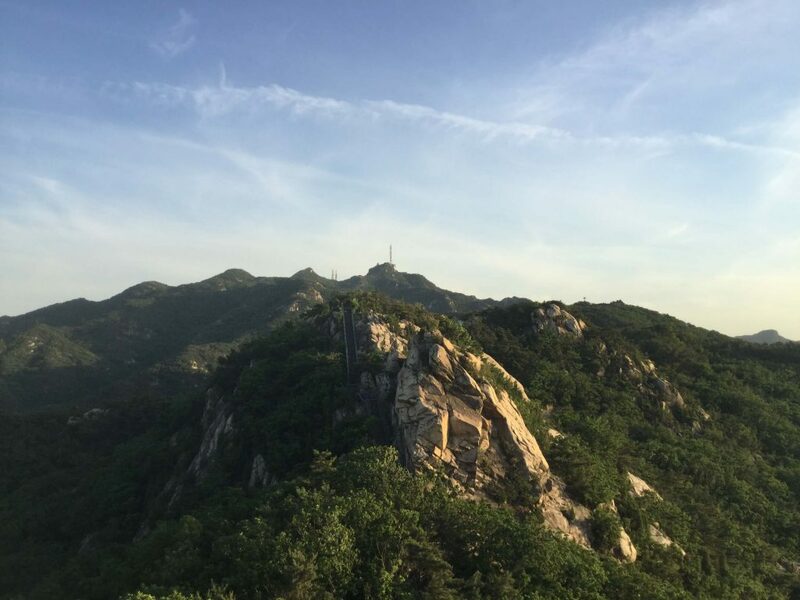 The ridge is a fun bit of rock scrambling, but if you don’t fancy that go to Yeonjuam first, and from there there’s an easier path up to Yeonjudae and the golf ball. 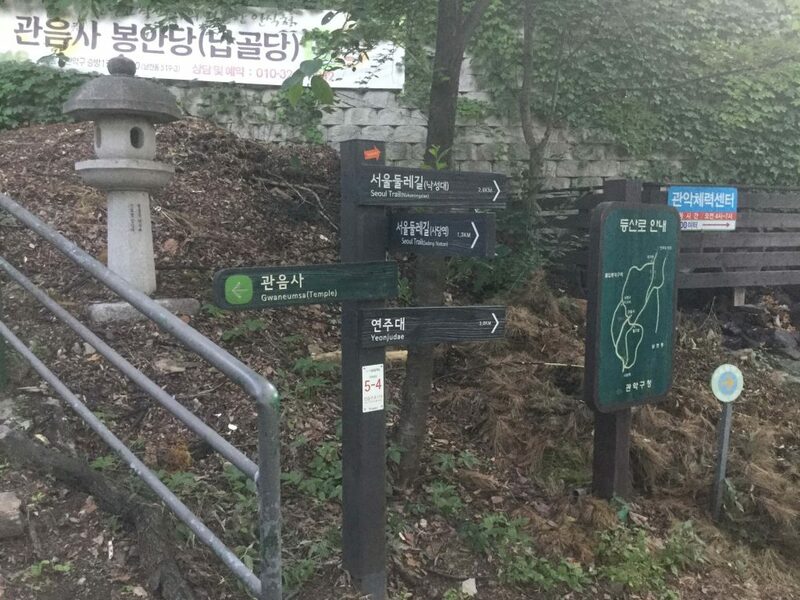 If you’ve come up another way and want to descend to SNU, from Yeonjuam walk up to the ridge and SNU is signposted from the trail intersection. To descend to Gwacheon, head down to the main Yeonjuam temple building and then take the path down the mountain from there; from Yeonjuam start by following the signs for 화장실 (which means toilet), then keep going down the path past the toilets and following further signs to 과천 (Gwacheon). Like the SNU route, it’s an easy and well-maintained trail through the shelter of the forest. When you reach the road at the bottom, turn left and then after a couple hundred metres turn right on the pedestrian street through the residential area to the station. 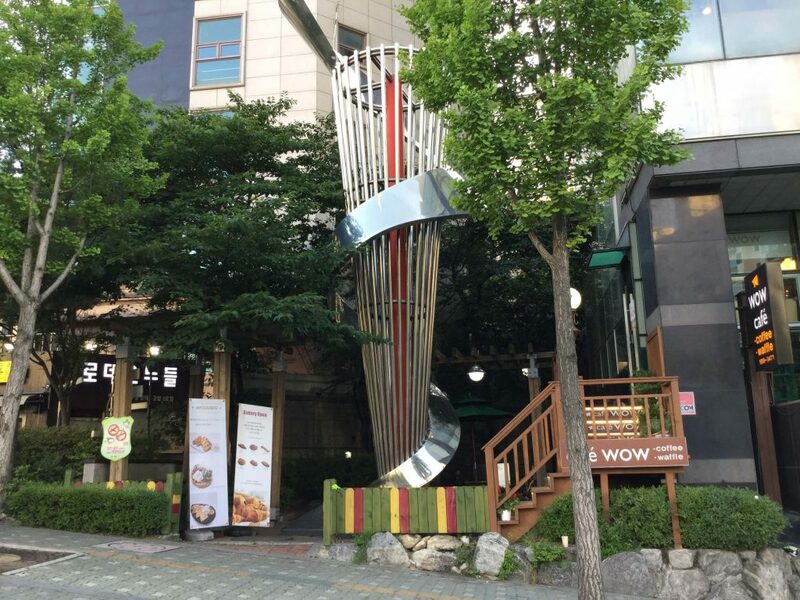 If you want to do the hike the opposite way and ascend from Gwacheon, take exit 7 from Gwacheon Station and walk straight along the path past some residential blocks. 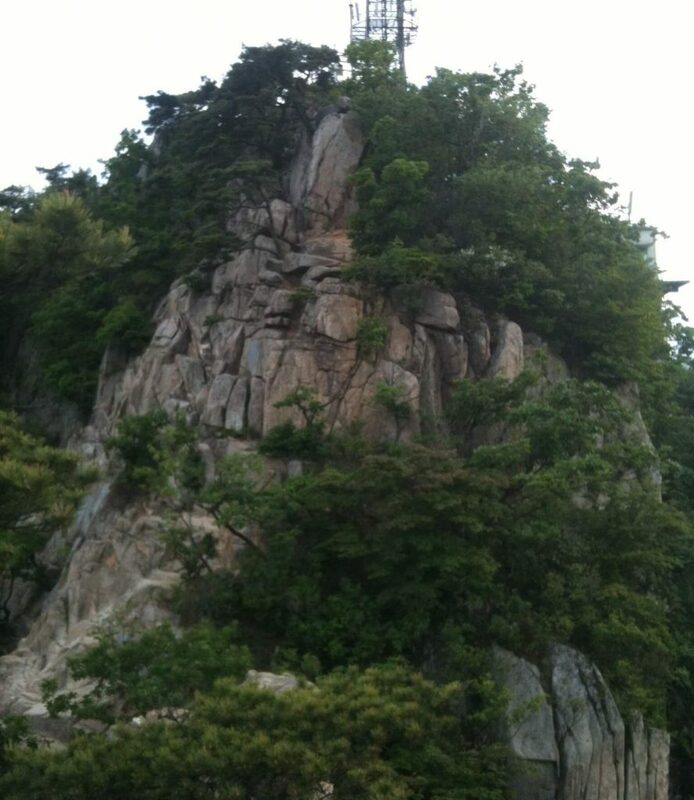 Have you climbed Gwanaksan? How was it? Any questions? Leave me a comment below! Woow, credit to you so precisely detailed and structured. We are heading out this weekend,and will follow your guidelines. Cheers Reni, hope you have a great hike! Brilliant, will be heading there tomorrow and great to have such detailed descriptions. Cheers Salma! 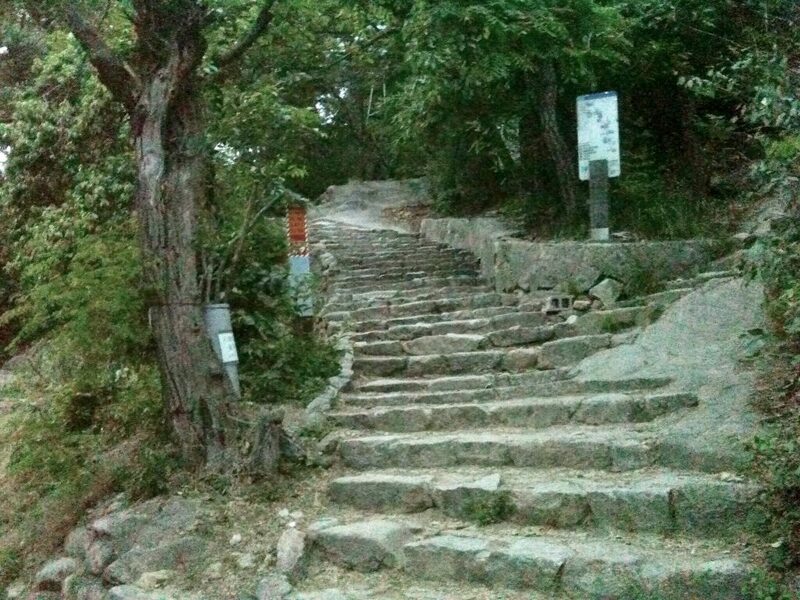 It’s nice hiking weather in Seoul this week – I actually hiked up Bukhansan just yesterday! Hopefully the pollution’s light tomorrow and you’ll get clear views. Enjoy! We took the Sadang route and enjoyed the entire day in the mountains. It did take us over 8 hours though (with lots of breaks) as we went over every peak there is so I am sure we took an even longer route than described above. 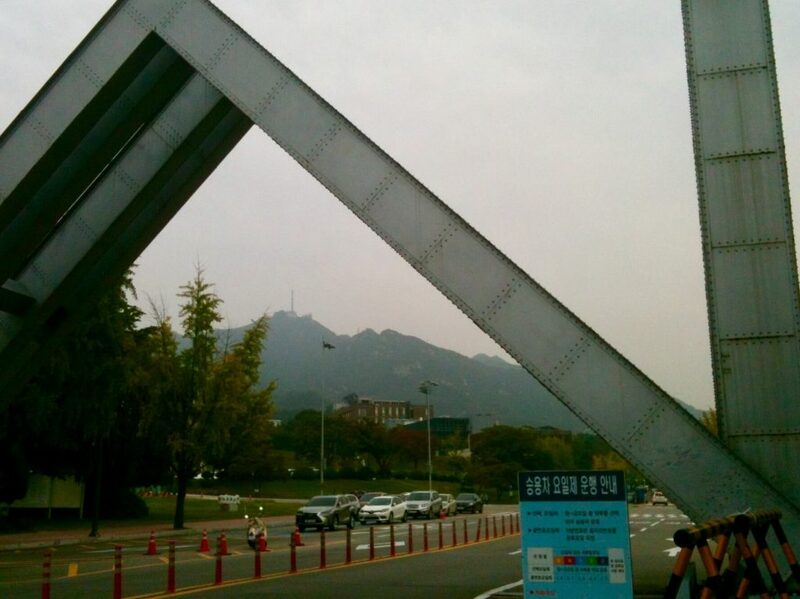 On the way down, we took the Seoul National University route which was lovely. It was an amazing spring’s day and we thoroughly enjoyed it. Thanks again for the insight. Hi again Salma, thanks for the update, glad to hear you had a good day! 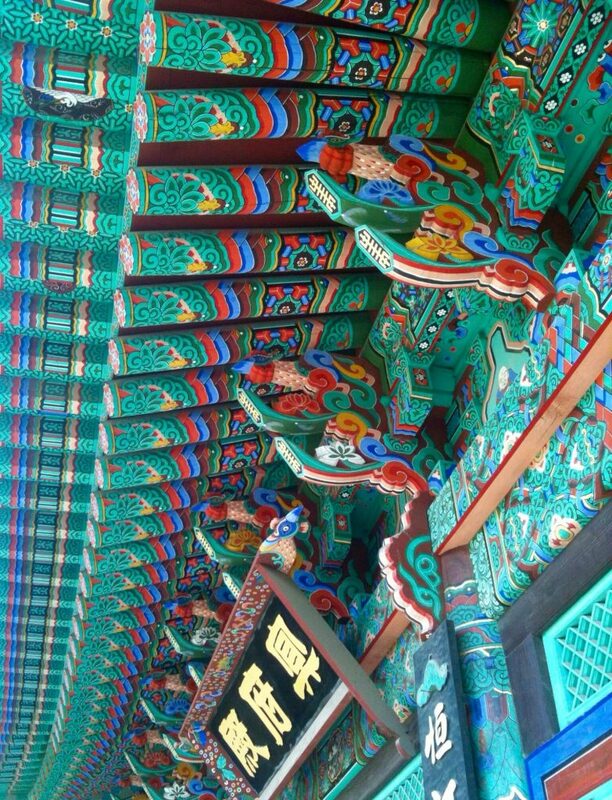 Hi, I am visiting Seoul in December from the 18th – 26th. 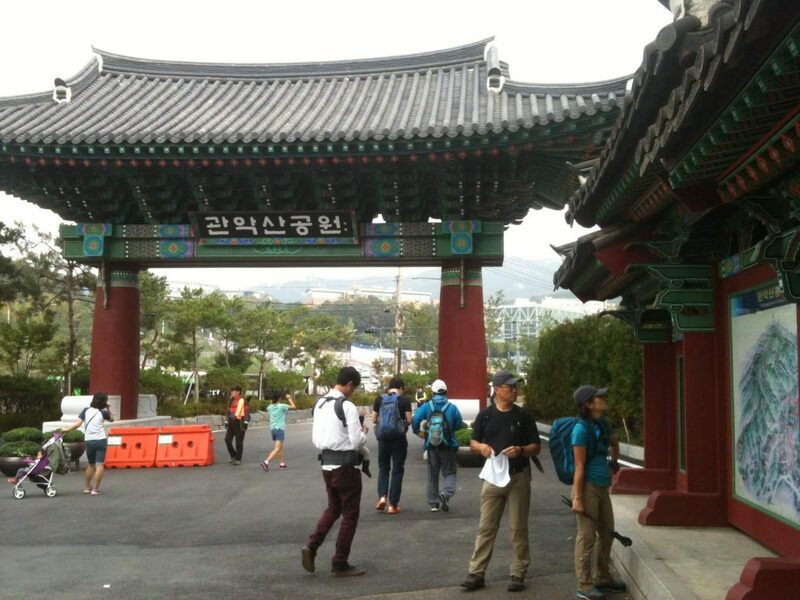 Is it advisable or worth it to hike using the Sadang Route for the duration i’m in Seoul ? The Sadang route is mostly fine in winter, but the scrambling sections at the top will be very tricky if there’s already snow & ice up there. So I’d only advise going that route in winter if you’re an experienced hiker and confident with winter conditions. The Gwacheon and SNU routes should be fine though. Oh alright ! The summit will be the same though right ? 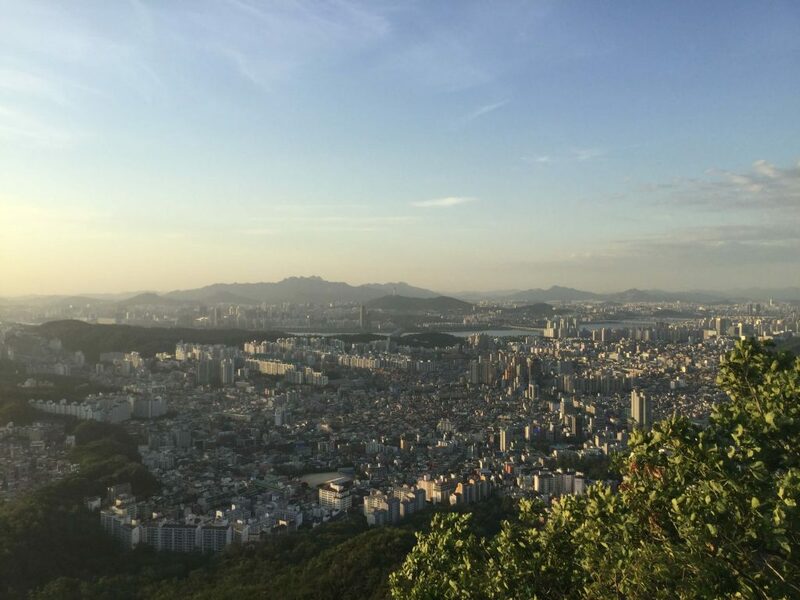 As in the views from the top will almost be the same as the Sadang route if I take either the Gwacheon and SNU routes cause I really like the pictures of the views you took from the Sadang route but if it’s dangerous, I’d rather not risk it. Yeah the summit will be fine and you’ll still get the views, no worries. 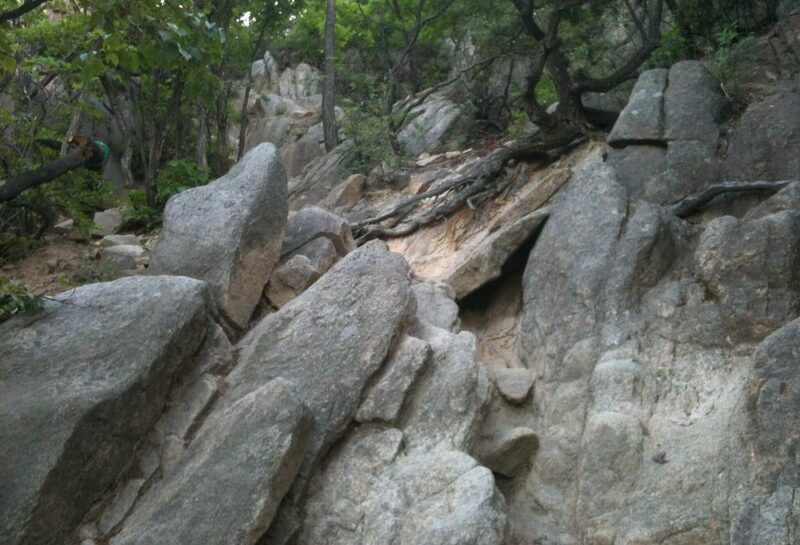 Another option – sometimes when I want a shorter hike, I just hike up the first bit of the Sadang route. Around the halfway point there’s a long flight of metal steps going up a steep rocky section, and there’s a great viewing deck at the top of those steps. So sometimes I just hike up to that, and several of the best photos on this page were taken from that viewpoint. Yes should be fine, but it snowed this weekend (I’m actually in Seoul right now) so I don’t recommend the Sadang route unless you’re prepared for scrambling in icy conditions. You can still have a nice hike using the SNU and Gwacheon routes, and present forecast for Wednesday is 7 degrees in Seoul (so maybe 0 or 1 at the top) which is fairly warm for December. Enjoy! Hi ! 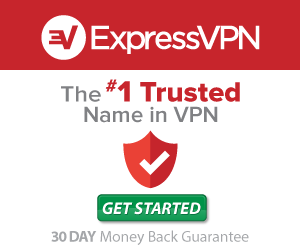 Thank you for all the help. Had a really great time exploring the area while I was there. Really glad that the information here is up-to-date and helpful. Keep up the good work and thank you so much. Awesome, thanks Fikri, glad you enjoyed it. Cheers! Thanks for writing this blog, you have provided very detailed information and it was very helpful. Cheers RaKee, glad to hear it!